The company is using its leading infrastructure to launch new services. Like many other Chinese stocks, JD.com (NASDAQ:JD) has sold off this summer. However, the company's recent second-quarter earnings report continues to show strong growth. In that period, the company grew overall non-finance revenue 31.2%, beating analyst expectations, while posting near-breakeven profitability. 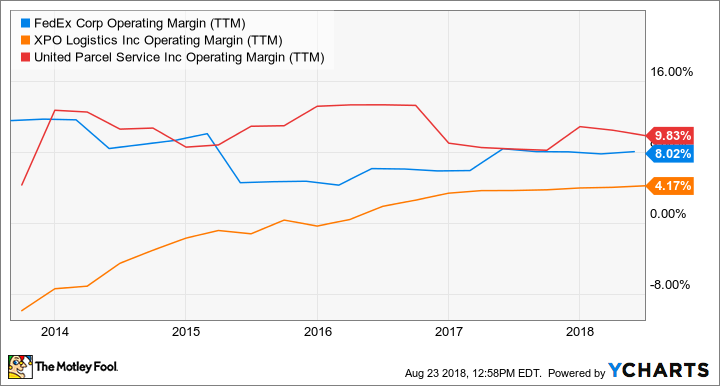 Non-GAAP (generally accepted accounting principles) net income fell 51%, but that shouldn't necessarily worry investors at this point: The company is investing heavily in technology, logistics, and real estate with the aim of building out its logistics footprint. Remember, JD.com is taking a page out of Amazon's playbook, reinvesting all profits to secure its leading logistics infrastructure in China. JD.com is not only using this infrastructure to sell its own goods on JD Mall but is now providing logistics services and expertise to other businesses. This "logistics-as-a-service" business is part of JD's "new business" segment, which also includes its international initiatives. That segment grew a whopping 151% year over year in the first half of 2018. JD.com is aiming for a new segment of the Chinese economy. Its roots are in selling electronics, appliances, and other big-ticket items to consumers, and these still make up over half of the company's revenue. Over time, it's added more general merchandise, which grew nearly 50% over the first half of the year, despite stiff competition from incumbent Alibaba. But remember: Whereas Alibaba sellers typically used third-party logistics services, JD.com decided to do the heavy lifting of building out its own vertically-integrated logistics infrastructure. That explains why it earns little in current profits, while Alibaba has fat margins. However, JD.com is now beginning to leverage that physical and technological infrastructure, launching logistics-as-a-service for business customers, including fast delivery, inventory management, demand forecasting software, marketing, and other artificial intelligence services. According to strategy officer Jianwen Liao: "Our vision is to leverage technology to develop lower-cost, tech-based, supply chain platform capabilities, integrating both hardware and software solutions. ... JD is moving from a vertical reintegrated model to an open model, to become a tech-driven retailer and a technology-based retail infrastructure service provider at the same time." China does not have large national couriers like FedEx or United Parcel Service; instead, it has many smaller logistics companies with more local footprints. JD.com's advantage is that it has built its own service, delivering roughly 95% of its own goods, as opposed to Amazon, which only delivers 5% to 7% of its U.S. orders (at least currently). As such, JD.com has the option of becoming both a direct e-commerce seller like Amazon and a delivery and logistics operator like FedEx, at the same time. Of course, that infrastructure is expensive to build. While the "new business" segment -- which is mostly logistics services in China and Southeast Asia -- earned an impressive RMB 5.1 billion ($0.77 billion) and grew 150% in the first half of this year, it's still unprofitable, with widening net losses of RMB 2.4 billion ($0.36 billion). That dragged the company's GAAP profits down into negative territory. While the market may be concerned about short-term profitability or the effects of tariffs, JD.com rightly has its eye on the long-term opportunity to build a profitable service business. Under Richard Liu's leadership, JD.com is investing aggressively to secure a leading position in the Chinese logistics market. While trade and macroeconomic fears have dominated the narrative recently, they may have opened up an opportunity for long-term investors.